Home Beers Lakefront Brewery, Inc.
Rendezvous | Lakefront Brewery, Inc.
Unsure of others definition of Biere de Garde but this is a true definition. An almost Belgian ale with fruity aroma and a sweet carmel taste. Little head on the pour but nice amber color. No spice or hops present. A smooth mouth and nice finish and aftertaste. 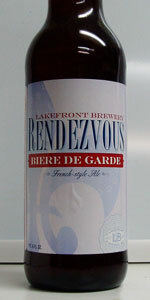 Rendezvous from Lakefront Brewery, Inc.